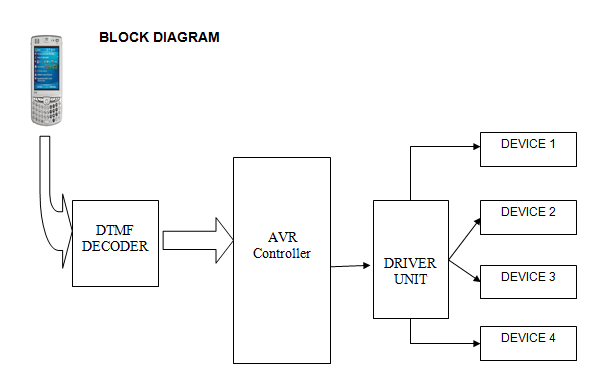 Microcontroller(ATMEGA16)hardware design with software development (Device Driver). This Project “GSM BASED HOME AUTOMATION USING AVR MICROCONTROLLER” is used to control the devices in home as well as in industries, Banks, and also in Remote areas. Conventionally, wireless-controlled appliances use RF circuits, which have the drawbacks of limited working range, limited frequency range and limited control. Use of a mobile phone for device control can overcome these limitations. It provides the advantages of robust control, working range as large as the coverage area of the service provider, no interference with other controllers and up to twelve controls. In this project, we control home appliances either AC Device or DC Device controlled by a mobile phone that makes a call to the mobile phone attached to the control board. In the course of a call, if any button is pressed, a tone corresponding to the button pressed is heard at the other end of the call. This tone is called ‘dual-tone multiple-frequency’ (DTMF) tone. The controller perceives this DTMF tone with the help of the phone stacked in the control board and operate. Ø A brief introduction to internal architecture of microcontroller. Ø An over view of programming of microcontroller. Ø An overview on C language. Ø An overview on mechanical arrangement. Ø DTMF interfacing with microcontroller. Ø Serial communication used for downloading the hex code. Ø A Cross compiler for compiling and linking the code written for ATmega16. Ø Serial communication software for downloading code to ATmega16. Ø Operating system: Windows XP.